Get up close and personal with the big game you seek. Gone are the endless hours of empty forests and unused shots. The search for the elusive prized trophy has never been more action packed or more realistic. Spot your prey quickly and get into position for the ultimate in hunting action. 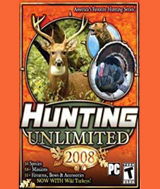 Scout for the perfect kill in 8 expansive hunting regions, complete with richly detailed animals and realistic animal behaviors. Play the challenges, free hunt mode, or target range. Design your own challenges for endless play.